The word “Ayudha” denotes weapon andPooja acts as a tribute to one’s profession and worship of various implements. The ritual is an inherent part of the “Navratri”, “Dussehra” or “Golu” and is widely celebrated in many Indian states. The festival is celebrated on the ninth day of the Navratri to worship the Goddesses Lakshmi,Parvatiand Saraswatiin different forms. This special occasion is usually celebrated in the Tamil month of Purattasi (September – October), also known as Bhadrapada month in North Indian calendar. Ayudha Pooja simply denotes paying reverence to the weapons used in one’s profession, be it a plow, pen or a musical instrument. The Pooja implies to treat one’s profession with great respect and on this day, the implements are worshipped with respect and gratitude. 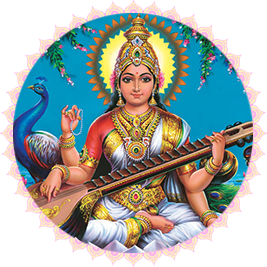 In South India, Ayudha Pooja is also celebrated as SaraswatiPooja, when children will worship their books and seek the Goddess’s blessing, who is the “Goddess of Wisdom”. Generally, this occasion signifies the celebration of killing the demon Mahishasura by the Goddess Chamundeeswari, an incarnation of Goddess Durga. It is believed that Goddess Chamundeeswari was bestowed with several weapons to kill the demon Mahishasura. The weapons were of no use when the Goddess killed the demon and hence they were worshipped separately. Also, the history of the ceremony penetrates into the Hindu Epic, Mahabharata. It is believed that King Arjuna, worshipped his weapons on this day, which he kept hidden in a Vani tree during his exile period of 13 years. He was a renowned Pandava king and was highly dexterous in archery.This ritual enabled him to get the blessings of Goddess Durga, which helped him to succeed in the war against Kauravas. The Pooja mainly involves the worship of weapons and implements. Hence, special pooja is offered to Goddess Saraswati in every house, office, and shop. People worship all sorts of weapons used in their profession. All the weapons are decorated with sandalwood paste, vermilion, and sacred ash. The day also involves Vahana (Vehicle) Pooja, when one’s vehicle including cycle, bike, car, truck etc. is thoroughly cleaned, painted or polished and decorated the same way as weapons. At the end of the ritual, a huge white pumpkin, coconut, and lime, decorated with vermilion and turmeric are smashed in front of the office/shop/house/vehicle. This is believed to ward off all evil forces surrounding you. Personal and Professional success, and swampy and labyrinth situations in life would vanish. Blissful life with abundant health and wealth.